Posting Web tutorial after a long time with a lot of energy and possibilities. There would be few things in life which would be life changing and support you even in worst times, yes of course, my blog and readers are my supporters who support me throughout my journey. When you're building an application that heavily depends on the pdf view to the customer and need to render as a part of the application, pdf js is right choice to go with it. Where you can control the contents of the pdfs with session maintenance (premium and free customers ), personalized pdf rendering. Make sure you have node.js installed in your system with sudo access. Open the shell and try to execute the commands. First of all clone the GitHub repo. 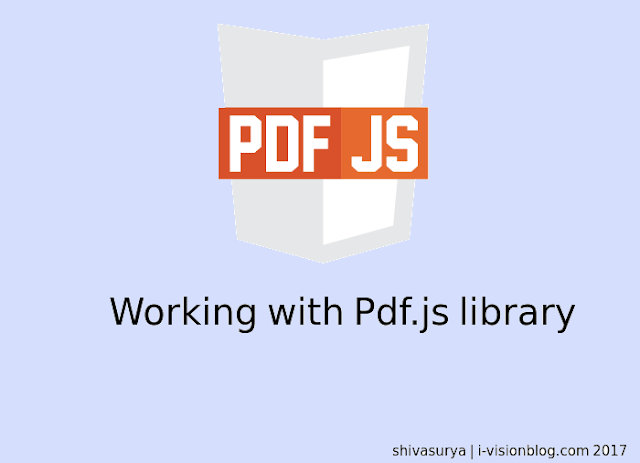 You can simply include the pdf.js in your script tag along with the pdf.worker.js file. Once it has been setup you need to write application logic based on your web application. So, this will import the whole pdf.js and its recommended to go for minified version while moving into production mode. You can download the whole application project from here. The above code simply loads the pdf from the local server and then renders all pages into Html DOM as canvas images. It's up to you to devise your own event click listeners to load next and previous pages as per your application logic. Hope you've liked this article. Subscribe for more tutorials and follow me in Google+/Facebook for updates. If you have any doubts chat with me or drop me a mail. Feel free to comment below. Share is care.